On our last week long Maui trip we snorkeled at over 20 individual spots. And at nearly every single spot we swam with sea turtles. It was fantastic! 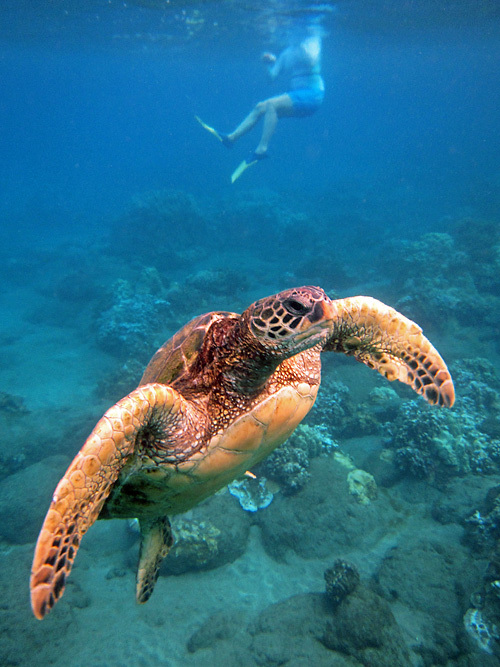 If you have not snorkeled with a sea turtle on Maui, it is a real treat. They are so graceful and seem so relaxed. In other parts of the world, they take off as soon as they see you. Sea turtles are protected from harvest and harassment in Hawaii and we have that to thank for being able to interact with them so much. We saw so many turtles at Hanakao’o Beach. 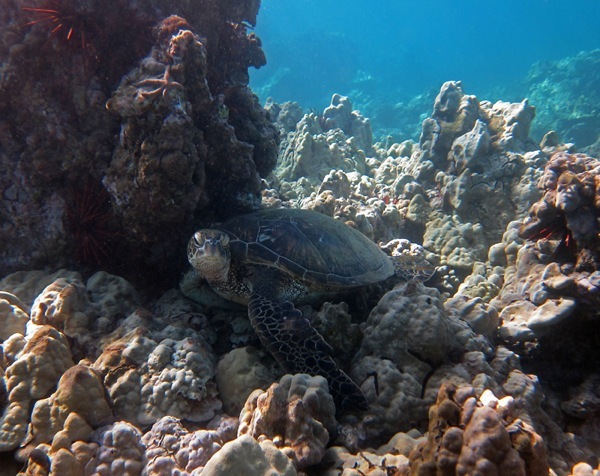 There were a couple who were swimming over the coral fields with us, but we got a big laugh when we found one that was resting on the bottom, but instead of tucking part of his shell under the coral, he had tucked his head so all we could see was the shell and fins. What a sight! But the interactions did not stop there. We came across a turtle who was clearly trying to stay on the bottom by getting under something, but there really wasn’t anything to anchor to, so he was just getting pushed around by the water movement. We watched him for a while and then he decided to come up to the surface for a breath. On his way up he headed straight for Galen, really checking him and his camera out. The turtle got right in his face so they were floating around each other for a long time with Galen taking very close up pictures of turtle body parts. We were having a great snorkel at the rocky point between Ulua Beach and Mokapu Beach, seeing lots of fish and pretty corals and urchins. We rounded the point heading back along the north side and noticed some divers swimming near the bottom in about 30 feet of water. They were carefully swimming near the edge of the reef looking under the ledge. We figured they were looking for turtles tucked under the edge of the reef. 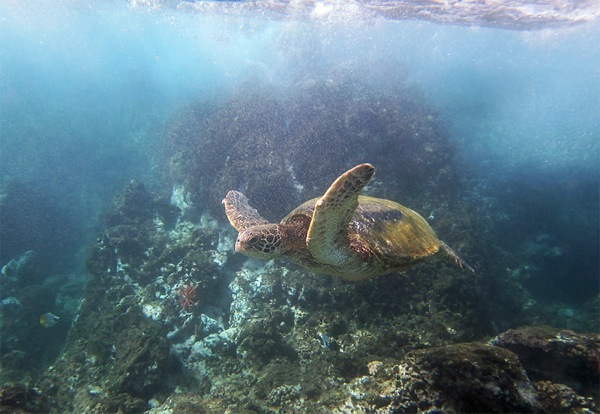 As snorkelers, we focus on the shallower reef and we lucked out because we got to see a turtle that the divers completely missed. It was tucked under the edge of a coral head in about 12 feet of water, 10 feet or more above where the divers were looking. It hung out calmly while we took pictures of it. At Five Caves the waves and surge wash over the tops of the lava rock points that jut out into the ocean. The water is full of white bubbles near the surface where it splashes against the rock. The rock is coated in the seaweed that turtles like to eat. We rounded a rocky point and a large turtle with a big tail, was allowing itself to be washed around by the waves while catching mouthfuls of food near the top of the rock. As we tried to get pictures and videos, we were getting tossed by the waves and surge a bit too. Turtles seem to be very patient with the movement of the ocean and “go with the flow” instead of fighting it and trying to stay in one spot. 1. Go snorkeling early in the morning. We saw the most turtles when we were out in the morning. 2. Look for them at the bottom, partly tucked underneath the edge of coral or a rock. 3. Watch for them floating on the surface breathing. thank you for sharing this wonderful experience. I am just remembering our snorkeling in 2005 and 2010. At both times we saw the turtles and were so surprised that they were so curious and not anxious at all. It would be helpful to inform people reading this that TOUCHING a turtle is not healthy for them. No matter how curious or attracted to them a person is, don’t touch them! They have no defenses against the viruses on our skin. Thanks so much for sharing those photos… they had me looking back through some of our dives photos from when we lived on Maui. 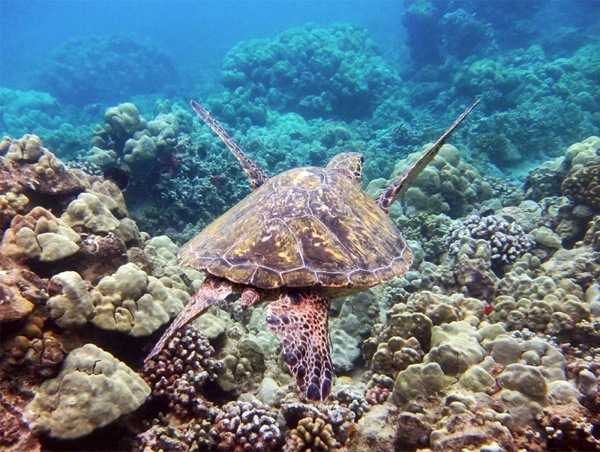 Maui became home of our hearts and sea turtles have special meaning to me. Mahalo!